Sentimental Blue Balloon Flower is a whimsical perennial that has flowers that resemble hot air balloons before they burst open with a brilliant blue flowers. It is a very compact plant with grey-green leaves. It will grow from 8" to 10" tall and from 8" to 12" wide. 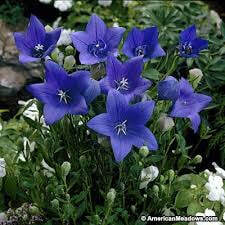 Plant Sentimental Blue Balloon Flower in full sun to part shade in well drained soil. It does not like wet feet. This makes a great cut flower for that vase on your dining room table or to brighten up a kitchen windowsill. It is deer resistant and grow well in a container planting. Use as a border, mass planting, or plant in a Cottage or Rock Garden.